Have you heard of Elizabeth Castoria's new book, How To Be Vegan? I'd seen it around, but I hadn't really read any reviews on it and whether it would apply to someone who is already vegan. I made my transition to being vegan over a year and half ago and I have learned so much. According to myself I'm doing a smashing job of it, so at first I thought maybe this book wouldn't apply to me so much. However, I know that there is so, so much more to discover and I'll never ever stop learning more ways live a compassionate life. I really discovered a lot from this book. How To Be Vegan covers everything from cruelty-free eating, living with kindness, dating non-vegans, traveling as a vegan, decorating with animal-free products and is also full of fantastic recipes. If there was a class on how to be vegan, this would be the textbook. But, definitely like a textbook you'd want to read because it is completely comical and very engaging (I don't know a lot of textbooks like that). Even if you aren't vegan, you probably know someone who is and I urge you to read this book for his or her sake. Plus, you might learn a thing or two about us veg-heads. Or maybe you'll be inspired to make a reduction in the animal products used in your life. Even if it's just a small bit. Elizabeth really makes starting out as a new vegan incredibly unintimidating and easy. I wish she'd released this book two years ago. Shes starts out with the basics. It's like Begin Vegan 101. Then, the book ventures into what being vegan means with regards to food. She also discusses what it entails to creating a vegan home. I really enjoyed the chapter on vegan-friendly traveling. Oftentimes, I feel that it can be wearisome to research. My favorite chapter is on manners and how to deal with difficult people, as well as how to interact with a significant other that might not be vegan, and of course, the much appreciated advice on holidays. I think all vegans can relate to the graph that demonstrates the correlation of the number of times a person is asked where he/she gets their protein as a vegan, in relation to the probability that his/her head will explode. It's titled Spontaneous Combustion - The Hidden Danger of Veganism. Elizabeth speaks the truthest of truths. This book will crack you up and it's a quick read because it's so entertaining and dynamic. It includes everything from a short history on veganism, to a list of vegan celebrities, to the positive impacts on the environment by reducing the consumption of animal products. I love the quippy quotes and funny infographics. There's a lighthearted spin to all the well-grounded information, that makes it really enjoyable to read. While Elizabeth does touch briefly on the horrors of why we shouldn't exploit animals, it's not dwelled upon. Which is especially nice for those with very sensitive hearts...like mine. I also like that this book is in no way demanding. There's no "You're not vegan if you eat honey!" or "Oreo's aren't healthy so you shouldn't eat them!" In fact, there's a vegan by accident list that I found especially interesting. I'm somewhat ashamed to admit that I do judge books by their cover. Literally. I can honestly say I was draw to this book a great deal because of it's cover. It's gorgeous! Not just the outside though. The inside of the book is splashed with colorful charts, side-splitting Venn diagrams (yes really, my favorite is Should I Date This Person? ), and beautiful color blocks and titles. Yep! Even if you aren't vegan and never plan to be. You'll probably learn a lot! If you've been vegan for 25 years, I still think you should read it. Even if you're the founder of veganism and know everything there is to know...it's hilarious and there's great recipes. Besides, do you really know the go-to vegan dishes for popular world cuisines? Probably not. Gochujang, a Korean chili paste, is usually vegan. Bet you didn't know that, I didn't. Unless you're Korean, then you might know that. I Want To Buy It Right Now! Alright, alright, hold your horses. It's probably (okay, maybe) in your local bookstore and if not, you can find it on Amazon. The best part is that after you've read this lovely book, you can tell all your friends about it. Pass it along to a veg-curious family or friend! Or, just leave it in your break room with a "Take me home and bring me back here when you've finished reading" sticky note. Who knows who you'll influence to lead a kinder life! 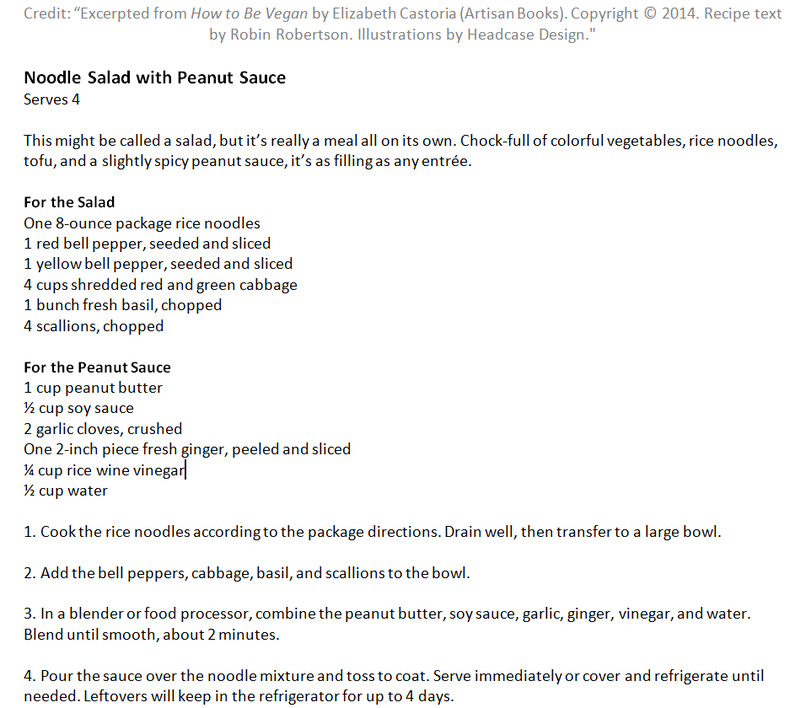 Artisan, the publisher, granted me permission to post a recipe from the book and I chose this wonderfully delicious Noodle Salad with Peanut Sauce. I made it exactly as written except I used a food processor to shred the vegetables and I drained off any excess juice into a cup first before combining. I gave the juice to my dog. Peppers don't really agree with me that much, "intestine"ly speaking. TMI. I've made these kinds of salads before and I learned the hard way that any excess liquids from vegetables really need to be drained off or the dish can get really soupy as it sits. I would also probably use half the soy sauce and leave the amount of water the same. Even with draining the vegetable juice, it was a teeny bit soupy still and quite salty for my tastes. Also, this is a cold salad. Make sure to keep it refrigerated and eat it cold or else all that peanut butter will melt! I may or may not oftentimes "forget" to put my lunch in the work fridge and I may or may not have done this with this particular noodle salad and...it was sad and soupy (my fault! )...but still really, really delicious! I definitely recommend you make this. This was such a wonderful book that really explained what it means to be vegan in a friendly and non-judgmental, easy sort of way. I am absolutely delighted by it and I hope you will be too. It doesn't matter if you're thinking of going vegan, or grew up that way. Let me know what you think of the book, if you read it! *DISCLAIMER* PRODUCE ON PARADE IS A PERSONAL BLOG WRITTEN AND EDITED BY MYSELF ONLY, UNLESS OTHERWISE NOTED. MY REVIEWS ARE COMPLETELY BASED ON MY OWN OPINION OF THE PRODUCT REVIEWED. I AM NOT PAID TO WRITE POSTS. THESE PRODUCTS WERE SUPPLIED TO ME AS GIFTS FROM THE COMPANY TO TEST AND REVIEW. OTHERWISE, IF I MENTION A COMPANY BY NAME AND THERE IS NO DISCLAIMER AT THE BOTTOM OF THE POST, I AM MERELY WRITING ABOUT SOMETHING I LIKE, PURCHASE AND/OR USE. THE FACT THAT I DO RECEIVE A PRODUCT AS A GIFT TO TEST AND REVIEW, WILL NEVER POSITIVELY INFLUENCE THE CONTENT MADE IN THIS POST.